After months of patience and perseverance we have finally received the upgraded hearing aids for our Kiriwinan medically trained heath provider to be able to be sent back to Kiriwina and provide help to our Caring for Kiriwina Village Health Volunteers. The severity of the hearing loss has complicated the process and there has been another slight delay today, the hearing aids should be fitted next Monday. We will keep you posted. I would like to thank at this point many people who made this dream a reality by donating time/energy and money to make this happen. Lone Asmin Sumbulla, the main donor behind this initiative, Doreen Baine (Hearing aid technician), Dr Pulotu at Ela Medical and especially Toks Bwiana (our In-country Manager). 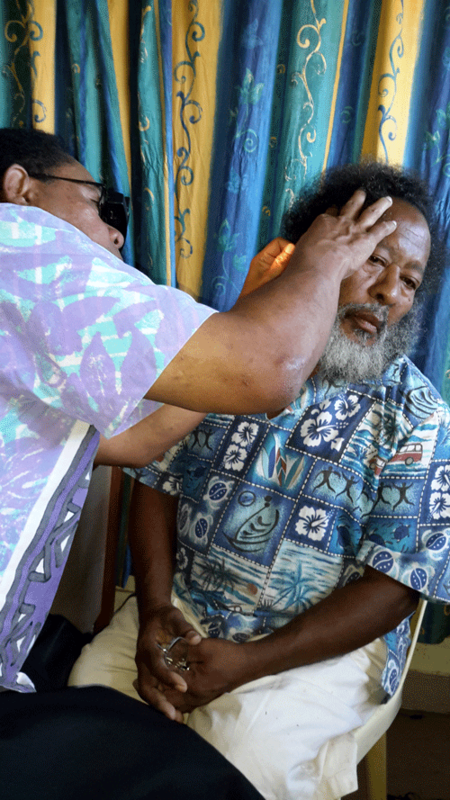 Photo: Jansen’s hearing being tested by Dr Pulotu. Yeah, a positive outcome is in sight. Yeah!, another 50 Birthing Kits winging their way to our in-country partners at Caring for Kiriwina. Caring for Kiriwina is organising training programs for the Village Health Volunteers midwives – As the midwives on the Islands last attempt at training was in 1989 we are in the process of organising the transport for Australian certified midwife’s volunteers onto island, costs include return airfares, accommodation and food for three weeks. We need donations to fund this initiative.. Please Care for Kiriwina and donate – www.gdg.org.au/GiveToJ903N. Thanks to the friendly Post Office staff. Off the Birthing Kits go, good luck and safe trip…thank you to our wonderful supporters Diana and Kylie Adams who dedicate many hours collating and packing with love.